The Dutch Science Foundation (NWO) has granted me a personal grant on the topic of self-supervised learning. The grant, named TOP grant, is intended for researchers who obtained their PhD maximally 10 years ago. In the proposal, I forward self-supervised learning (SSL) as a reliable mechanism to have robots learn in their own environment. In SSL, robots have a baseline perception and behavior module, which allows for initial operation. In the same time this module provides supervised targets to a learning process that extends the robot’s capabilities. Where previous work has shown the potential of SSL in isolated case studies, I will now perform – together with the PhD student funded by the project – the first structured study of SSL. The key innovation is the extension of SSL with novel elements and identify and propose solutions to fundamental challenges in the way of its widespread usage. This image shows a self-supervised learning setup in which a robot with a stereo system uses the stereo-based distance estimates to learn how to estimate distances also with only one camera. After learning, fusion of the distances from the stereo algorithm and the monocular distance estimation lead to more reliable distance estimates. This setup is described in an article that is to be presented at ICRA 2018, in Australia. 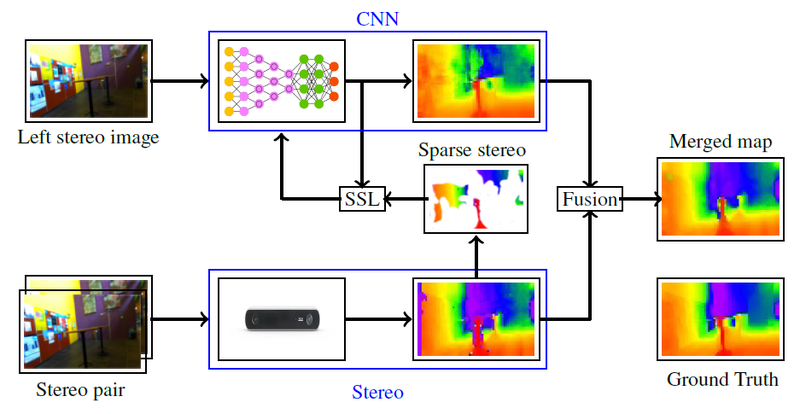 In the TOP grant project, we will study fundamental aspects of self-supervised learning, such as the guarantee of a baseline performance and the fusion of baseline and learned perceptual capabilities. If successful, the research will have an impact on many different types of robots, which will be able to significantly improve their perceptual capabilities over time. Read more on the NWO web site.